A solitary, tall, moderately slow growing, dioecious palm. Not known in cultivation, vulnerable in the wild. It has a rough, grey-brown trunk, 30 m. (98 ft.) tall, 26 cm. (10 inch) diameter with no obvious leaf scars, and huge segmented, pinnate (feather) leaves, 3.6 m. (12 ft.) long, 1.2 m. (4 ft.) wide, green above and beneath. The trunk is slightly ventricose bulging from 26 cm. to just below the crown where it bends and narrows to about 18 cm. Ravenea krociana can tolerate close to freezing conditions. But low temperatures are best avoided. 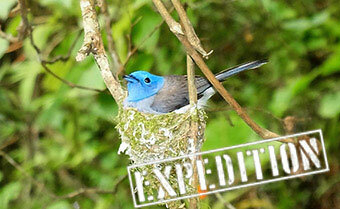 It naturally occurs in wet rainforest or seasonally wet forest in low montane locations. 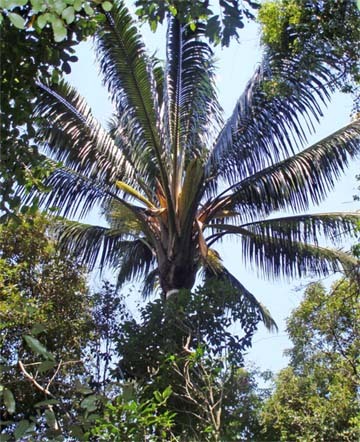 In this type of natural environment temperature fluctuations are slight, and this palm prefers a constantly cool or mild climate with little temperature difference between day & night, and Summer & Winter. Under extreme cold conditions we recommend you keep this palm as dry as possible, and well wrapped up. Moist forest, on steep to rather flat mid slope at Andohahela. 420-545 m. Elevation. It could be possible to an elevation close to 1000 m. in this area.